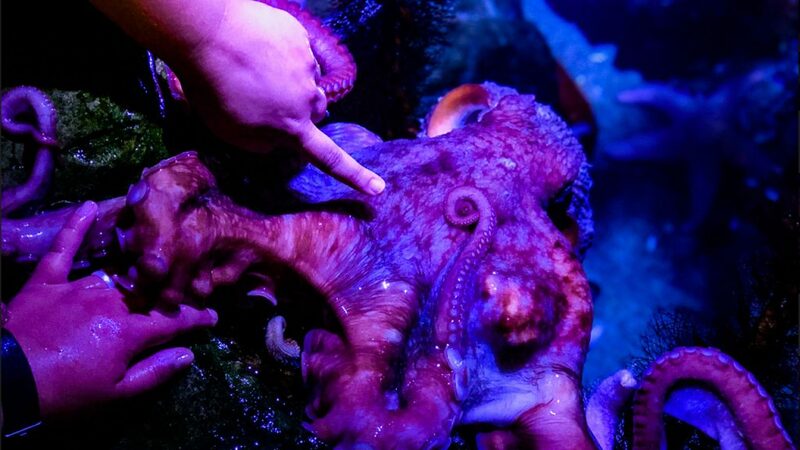 Cephalopod Celebration is right around the corner and we want to give you the inside scoop on these multi-armed and tentacled creatures. You can be a cephalopod expert even before you visit! Cephalopods are ancient, with their first relatives showing up in the geologic record more than 485 million years ago (that’s way before the dinosaurs and even before sharks!). These ancient shelled cephalopods went through may extinctions and evolved into different species that died out during catastrophic mass extinction events. What’s the difference between an arm and a tentacle? Arms, like those on an octopus, have suction cups the entire length of the limb. Tentacles only have suction cups near the end of the limb. Some Cephalopods have arms, some have tentacles, and some have both! All cephalopods have either arms or tentacles, have blue-colored blood, and have the ability to use propulsion to help them move swiftly when needed. They use gills to breathe and are invertebrates (lack backbones). Many cephalopods grow fast and die young, the average lifespan of most is just one to three years. Event the largest, the giant squid, grows to its gargantuan size in just a few years. The only exception is the nautilus which can be much longer lived. Octopus are the best known of the cephalopods with their charismatic personalities, intelligence, and diversity. There are about 300 different types of octopus currently known, and new types are discovered by scientists relatively often, especially in the deep sea. Octopus have eight arms with two rows of suction cups extending the full length of each arm. The arms come together at a centralized mouth with a hard parrot-like beak. Male and female octopus have the same number of arms, but males have one arm that is slightly different and is designed to hold and deposit sperm packets into the female octopus. Octopus can be found from the deep sea to coastal tide pools, and from warm tropical seas to the frigid Arctic and Antarctic Oceans. They can be huge, like the the Giant Pacific Octopus of the cold waters of the North Pacific, whose average 50 pound weight and 15 foot arm span dwarfs most other octopus. The smallest, Octopus Wolfi, is barely 2.5 inches across and weighs less than a paperclip. Octopus, in general, are masters of camouflage. They have the ability to change both the color and texture of their skin. Specialized cells called chromatophores expand and contract exposing different pigments within the skin. This can help octopus, and other cephalopods, blend in with nearly any background and communicate their feelings to friend and foe. By contracting different muscles, octopus can also change the texture of their skin, hiding among rocks, boulders, seaweed, or corals with ease. Octopus have 3 hearts and 9 brains! There is one central brain, and then each arm has a rudimentary brain. Octopus can regrow arms, they just need a portion of it to be remaining. Smallest: Flamboyant Cuttlefish or Dwarf Cuttlefish – both are about 3 inches long and weigh just a few ounces. Cuttlefish are both masters of disguise and communication. They are able to expertly flash colors and patters in psychedelically moving displays. 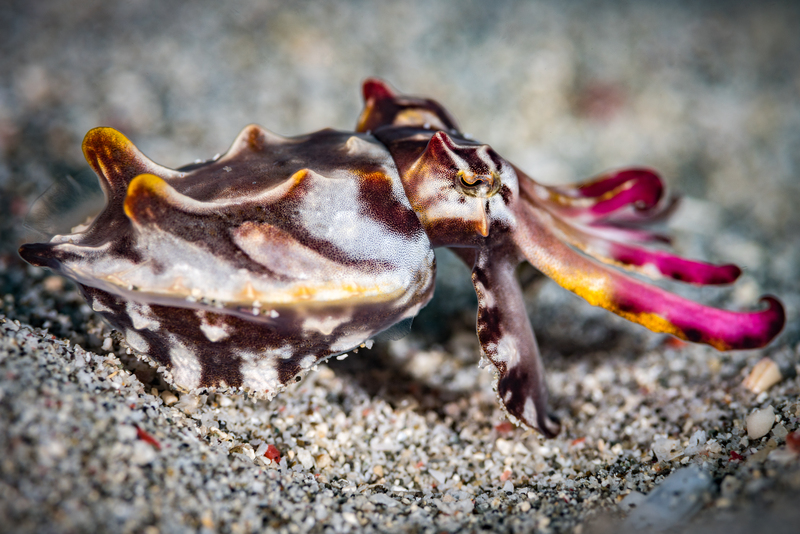 Cuttlefish, on average, have the largest brain-size to body-size ratio and these big brains might have something to do with their complex communication. Their flat bodies and cuttlebones (the oval, calcium-rich bone is porous) helps cuttlefish hover along the seafloor as they look for small prey. Though cuttlefish may look cute and slow, they are expert predators. Their two long tentacles are usually tucked in among their arms when resting, but when it’s time for a meal, they get ready to strike. When food like small fish or shrimp is within range, the cuttlefish points and aims its arms at the prey and shoots out its tentacles with lighting-fast speed. Squid have long, fusiform (torpedo-like) body shapes, allowing them to zip through the water with ease. Using jet propulsion as well as two small fins at the top of their long mantle, squid are able to move forward and backward in the ocean with great speed and maneuverability. There are more than 300 types of squid that can be found in oceans world-wide. Some are coral reef experts, some spend their entire lives in the open ocean, some can fly, and others live on the bottom and use their specialized arms to “walk” along the seafloor. Squid are an important commercial fishery world-wide. Most squid are fished at night when huge lights are shined on the surface of the ocean to draw the squid up from the depths. During the day, huge schools of squid stay in deeper water where the lack of sunlight allows them to hide from predators. At night, they migrate vertically to the surface in the safety of dark to hunt for prey. The squid are drawn to the lights on the fishing boats and are easily scooped up by the fishermen’s large nets. Here in Southern California, you can identify squid boats by their bright lights during the spring and early summer season. Giant Squid grow incredibly quickly and reach their adult size of 30-40 feet after just a few years. Scientists believe their lifespan is up to 5 years. Humboldt Squid (see a specimen in Oddities) travel in packs based on size. 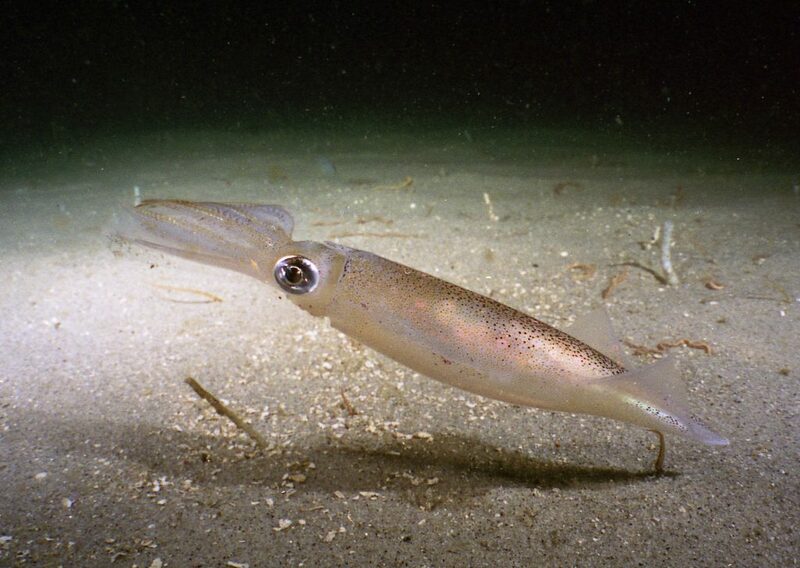 Younger smaller squid need to avoid the larger 6-foot adults or else they risk becoming a meal. Smallest: Bellybutton Nautilus – 6.5 inch shell diameter and weighs less than one pound. There is also a dwarf population of Chambered Nautilus that may be even smaller. Modern day nautilus are sometimes called living fossils, this is sort of true. 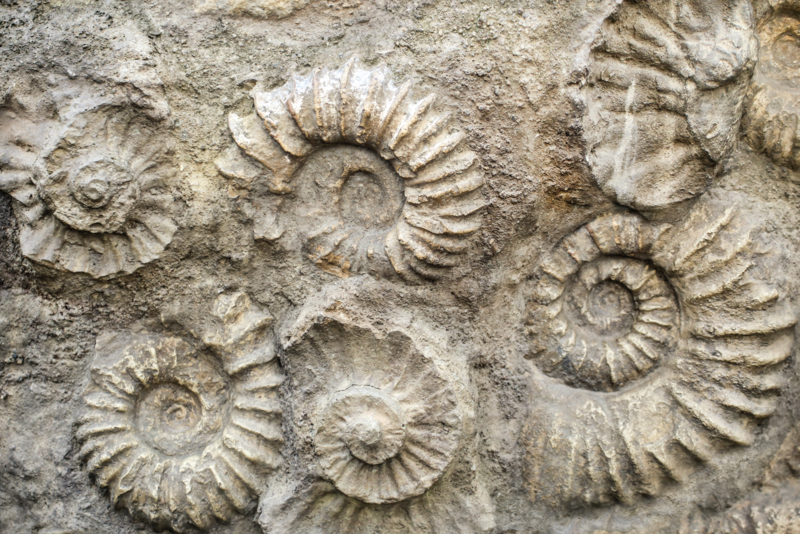 Ammonites were common shelled cephalopods from about 400 million years ago until they were practically wiped out during the K-PG extinction event — the same one that killed off the dinosaurs. Ancient ammonites, though they look like modern day nautilus, were actually more closely related to octopus, squid, and cuttlefish. The shelled body evolved again and today’s nautilus are the most distinct of modern cephalopods. One of the largest differences between ancient ammonites and modern nautilus, is that paleontologists believe ammonites could retract into their shells, where as nautilus cannot. 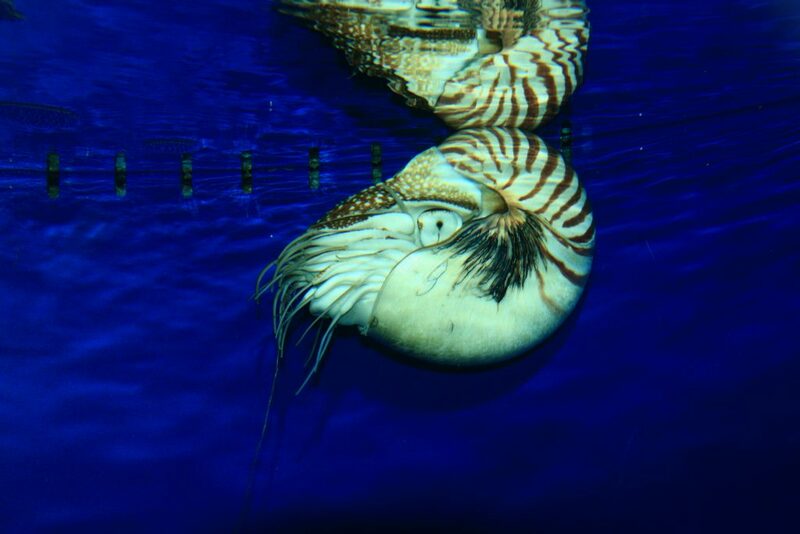 There are six different types of nautilus and all have external shells that they cannot retract into. They have unusual arms compared to the rest of the cephalopods. Their arms are numerous (often more than 90) and they do not have any suction cups. Instead, they have thin structures called cirri that retract in and out of sheaths at the end of each arm. Though not hard like a cat’s claw, you can imagine each cirri retracting into a sheath similarly to a cat retracting a claw, then springing out when it’s time to catch prey. Most nautilus are found in warm waters but spend most of their time in the deep, dark, depths. During the light of the day, nautilus will hide up to 2,000 feet below the surface. When under the cover of night, they come to the surface, searching the shallows and reefs for prey. They return to the depths at dawn. Unlike their cousins the octopus, nautilus are not known for having a good memory. Nautilus are the longest living of the cephalopods. Information found in their shell show that some can live to be more than 20 years old.